Discover this unusual home theater construction project in a Ahuntsic residence in Montreal. Take advantage of our expertise as a general contractor in residential construction, and our turnkey construction services! Call us today for a free consultation! Who hasn’t wanted to enjoy the atmosphere of a real movie theater, while staying in the comfort of their own home? A project of this size is not to be taken lightly. 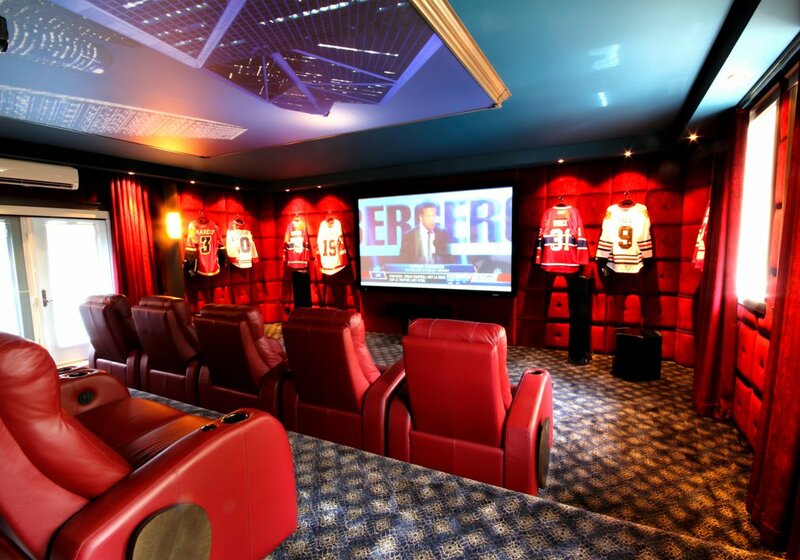 Our client’s wish was to create a home theater in his residence, with a sports theme, which will be used both for film viewing and for sports events. The basement remains the best room for a home theater. First of all, it is darker than the rest of the house, but also has a rectangular configuration, which avoids floating echoes. In this case, the basement room provided the perfect space for this project. First, we made many changes in the electricity configuration, including the installation of a high-end sound system, a large-format flat screen television, but also a multimedia system for better signal reception. We have also added an air conditioning system for the comfort of the guests, but also to prevent the room from being overheated and damaging the electronic devices. One of the most important aspects of a home theater is the complete soundproofing of the room. For the floor, we installed an acoustic membrane and a carpet to limit sound propagation. We had to open the walls to install gypsum panels that have great soundproofing properties and high quality acoustic protection. These panels were then covered with a velvet coating that at the same time gives a certain style to the piece. Finally, we opted for acoustic panels to soundproof most of the ceiling. We focused on soft, but still present, lighting to highlight the piece but also the collector’s items that our client wanted to add to complete the decor. The room, made in several levels, also allowed the installation of comfortable chairs for watching films or sporting events for about ten people. The final result gives the impression of a real cinema created according to the tastes and precise requests of the customer. He was impressed with the speed of our team and the result exceeded all his expectations. As a general contractor specialized in residential construction, we take care of all the steps of your project, regardless of its size and duration. To do this, we have established long-term partnerships with electricians, refrigeration engineers, painters, plasterers, interior designers, and even sound engineers, so that your project is a success all along. If you have any questions about this amazing home theater construction project in Ahuntsic, our turnkey construction services, our prices or our other services, don’t hesitate to contact us by email or phone. Your first consultation is free of charge! Our team will be happy to welcome you and provide you with all the information you need.